Start by signing up for our email updates by filling out the form to the right. When you submit, you'll be signed up and then directed to our online subscription form. The Best Companies to Work For – These 2013 winning companies know how to keep employees happy. NHTI Expands Career Paths – Investments here are attracting a younger demographic. Is Your Non-Compete Useless? – A recent ruling may force companies to think differently about those contracts. Airport Economics – In this second part of our series on the Manchester Airport, we look at the broader economic effect of the airport on the community. 2013 Shades of Gray – Creating a culture for those in their fifties and up, developing a road map for retirement, trends in 401(k) planning and reexaming philanthropy post-retirement are some of the stories in this year's edition. Climate Change&comma; Restaurant Weeks&comma; Engineering and more. 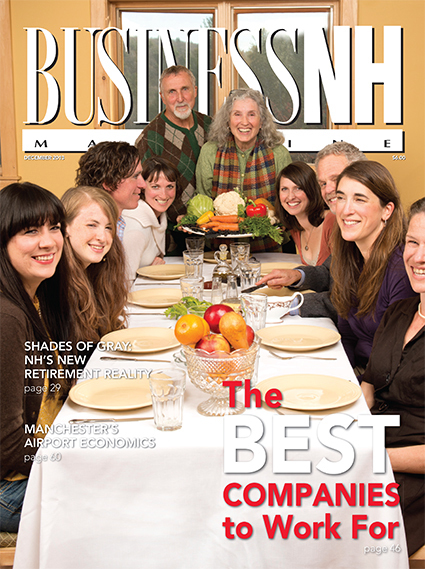 Copyright © 2005-2019 Business NH Magazine.